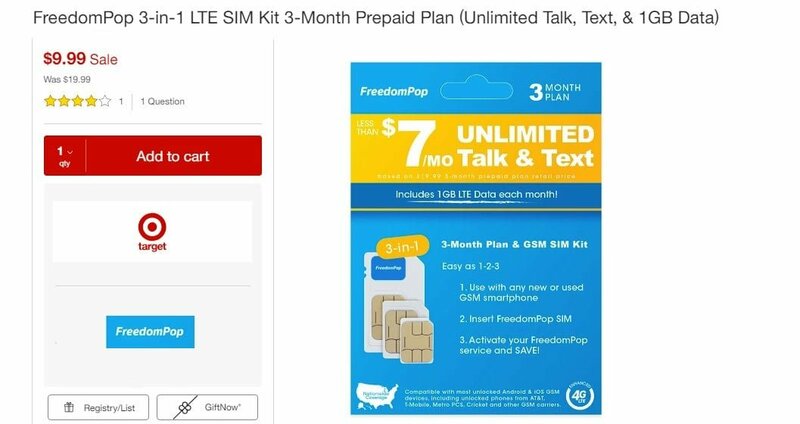 Target is currently selling FreedomPop's multi-month plan with unlimited talk, text and 1GB of 4G LTE data for $9.99. The plan is for 90 days and works out to an average cost of just $3.33/month. Normally the plan retails for $19.99. The allotments of talk, text and data are the amount that you get each month. FreedomPop is an MVNO of both AT&T and Sprint. This plan is for service on the AT&T network. Besides talk, text and data, this plan also comes with voicemail and MMS. However, voice and text messaging are provided through an app from FreedomPop. Voice calling is by way of VoIP and not over a cellular voice network. After the first three months of service is up, you'll have the option to renew the plan for another 3 months at its regular price of $19.99. Taxes and fees are not included in the price and do cost extra. If you have a phone that is either currently being used on AT&T or was previously used on the network, it is compatible with this FreedomPop plan as long as the phone is not under a contract. Phones that are compatible with T-Mobile's network will also work with this plan as long as the phone has been unlocked. For maximum compatibility, any other unlocked phone compatible with LTE bands 2,4,5, 30 and either 12 or 17 will also work.